Sometimes poultry can become egg bound when a large egg ‘gets stuck’ in the oviduct. The bird will usually keep visiting the nest box without being able to lay the egg and will keep straining. If the abdomen of the bird is examined, the egg can often be felt. A particularly large egg is often the cause of a bird becoming egg bound. The image to the right is an X-ray that clearly shows an egg that has become lodged and cannot pass without assistance. One way or another, the egg has to come out but thankfully there are a number of ways to assist the bird to pass the egg naturally without a trip to the vets. Cleanliness is very important so that you do not get bacteria into the oviduct so ensure your hands are washed before you start, First, the vent should be examined, and with a clean finger, try to establish that there is an egg. Olive oil can be applied to the vent, then the abdomen can be pushed gently and the egg might come out without too much of a problem. A warm bath of water for 20 minutes or so can help. Another technique I have used with a bird that was brought in to me once was by using a bowl of steaming water. Be careful not to scald the bird. Place an old towel over the rear of the bird and let the steam build up underneath. If you cannot get the egg out in this way, then assuming you can see it, you will need to break it in order to remove it. Do this by making a small hole in the end of the egg, then drain the egg. (you may find it useful to mix up the egg yolk and white using a cocktail stick through the hole so that it will drain more easily). The egg shell can then be broken carefully and removed. Of course you have to be very careful when doing this and the bird must be held securely so that it can’t struggle and cause itself an injury. 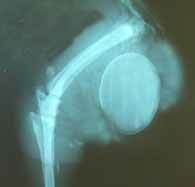 If you are in any doubt, take the bird to a poultry vet who will be able to help. The bird should be housed somewhere quiet, away from other birds. It is likely that there will have been muscle damage to the oviduct which may never recover fully, or cause prolapse (correctly called prolapsus) where part of the oviduct ‘hangs out’ and needs to be tucked back in again.